Our unique Chain Reflex® training method is a multi-disciplinary wellness program in which every aspect is supervised by a doctor. The customization of your fitness program doesn’t begin with a cookie cutter exercise regimen – it begins with you. Dr. Daryl will go through a careful analysis of not only your goals, but also your truth of function. These aspects of who you are will inform the strategies he will develop and the tools you will use to help you move better and feel better. 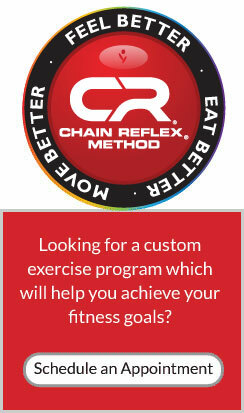 We live our lives in three dimensions, and Chain Reflex® will help you strengthen in all planes of motion. Dr. Daryl’s unique approach is strictly one-on-one to help you better understand your own movement patterns and to help you make adjustments where necessary. Whether you want to make it through your normal day without pain, run a marathon, hit the golf ball farther, or if you need rehabilitation, Chain Reflex® will be highly effective in helping you reach beyond your goals.